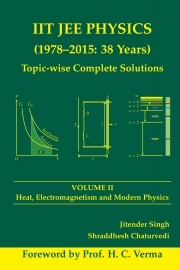 Description of "IIT JEE PHYSICS (1978-2015: 38 Years) Volume II: Heat, Electromagnetism and Modern Physics"
5. High quality figures and mathematical typesetting. Jitender Singh is working as Scientist in DRDO. He has a strong academic background with Integrated M. Sc. (5 yrs) in Physics from IIT Kanpur and M. Tech. in Computational Science from IISc Bangalore. He is All India Rank 1 holder in GATE and loves to solve problems in Physics. He is part of Prof. H.C. Verma team dedicated to improve quality of Physics education in the country. Shraddhesh Chaturvedi holds a degree in Integrated M. Sc. (5 yrs) in Physics from IIT Kanpur. He has been working in industry since then at various positions. He loves problem solving and philosophical writings. Reviews of "IIT JEE PHYSICS (1978-2015: 38 Years) Volume II: Heat, Electromagnetism and Modern Physics"